Voters can mark their stamp in any of the twelve boxes. The votes are then all pooled up to the party level, and seats are distributed to parties just as in a closed list system. For example, all the votes in the first column are summed to get the total for the People’s Party. Let’s assume that the People’s Party got 1000 votes: 700 people voted for the party without expressing a preference for any individual, 80 voted for Chen, 20 voted for Lin, and 200 voted for Huang. If the 1000 party votes were enough to win one seat, that seat would go to Huang. If it were enough for two seats, Huang and Chen would be the winners. Proportionality. Unlike the old SNTV system and especially unlike the current mixed system, open list distributes seats according to the party vote. Opportunities for small parties. This depends on the size of the districts. With larger districts, smaller parties have an opportunity to win seats. It isn’t quite as easy as in the old SNTV system. For example, in the old 10 seat SNTV districts in Taipei City, a candidate might win a seat with as little as 3-4% of the vote. In open list, a party would probably need to get closer to 7-8% to win a seat in that district. However, winning seats is still far easier for small parties in open list than in the current single seat districts. Parties can win seats all over the country. One of the worst things about the current system is that the KMT has become a northern party and the DPP has become a southern party. The KMT legislative caucus thus is constantly tempted to ignore the south while the DPP caucus has almost no one to speak for northern interests. The two big parties also have a hard time fielding credible candidates for executive races in the other area since they don’t have any incumbent legislators in those areas. Whatever the next system is, it is imperative to remedy this flaw. Empower list legislators. For the past 20 years, Taiwan has had two types of legislators: list legislators and “real” legislators. List legislators have always been seen as second class legislators. On the one hand, they are looked down upon because many believe they didn’t win their seats in an open contest. Instead, the seat was given to them by a party leader. On the other hand, because they weren’t forced to contest a general election, many of them have never needed to develop power resources (networks, money, mass popularity). District legislators have these sorts of power resources and can often simply push list legislators aside. You can see this condescending attitude toward list legislators in the two term limits. No one thinks of limiting district legislators to two terms since they win their seats and do a service to the party, but list legislators are seen as consuming party resources and are therefore a net drag on the party. Sooner or later, Taiwan is going to have to come to grips with this caste system, especially if the legislature is expanded by expanding the number of list legislators. The open list system would force list legislators to “earn” their seats by winning large numbers of votes, and it would thus narrow the gap in power between district and list legislators. Drawing districts. Open list uses multi-member districts, so it is not necessary to manipulate district lines for political advantage. This is one of the worst problems with the current system. One thing that I don’t care about might be the prime attraction to political parties. I have a suspicion that the reason Kao Chih-peng wants open list is that the DPP has had such a hard time figuring out a fair way to rank the lists. Open list would sidestep this problem by delegating it to the electorate. I say, if a party can’t figure out how to make a decision on a relatively simple matter such as constructing a party list, it might not be qualified to tackle more complex tasks, such as governing the country. There are a few downsides to open list. As you might expect given its similarity to SNTV, most of these complaints are familiar to us in Taiwan. The most common complaint is that open list encourages localism, particularism, pork-barrel politics, and money politics. This is almost certainly correct. In general, the more party-centric a system is, the cheaper elections will be. If campaigns are primarily done by national figures on a party vs party basis (such as in closed list or a presidential election), they can use the ample national media coverage to communicate party positions to the electorate. This takes advantage of economies of scale. Individual candidates in a candidate-centered system (such as open list) have to target smaller groups of voters with some appeal that differentiates them from all the other candidates in their party. Local construction, vote buying, and one or two extreme positions are great ways to set yourself apart from all the other wonderful candidates on your party’s list. In particular, we should probably see a lot more wasteful development projects with open list. Pork is great for the constituency that gets it, but everyone else hates it. If you are only appealing to a small part of the country, pork is wonderful. If you are talking to the entire country, pork may alienate more voters than it attracts. The other major downside is that open list can create factionalism. In SNTV, one of the primary roles of factions is to secure nominations for faction members. In open list, nominations are not as scarce. Since every vote counts toward the party total, parties have a strong incentive to nominate as many candidates as are legally permitted. So nominations are only a minor source of factionalism. The major impetus comes from the way that open list rewards superstars. A superstar who vacuums up large numbers of votes in an SNTV election hurts her party by causing fellow party members to lose. In open list, those votes are pooled and help the other party members to win, so the other party members appreciate the superstar and want to run in the same district with her. If the superstar clashes with the party chair or other party leaders, she can count on support from other legislators in her district. They certainly don’t want her to leave the party and run on a different list. If a party has several of these superstars, it might be difficult to hold the party together. Let me reiterate: I think Taiwanese parties need a bit more fragmentation. Taiwan does not have many access points for dissatisfied people to press their claims. Taiwan is not a federal system, and local governments do not have lawmaking authority. Taiwan does not have an upper house. The judicial system is not really a co-equal branch of government, to say nothing of the useless Control Yuan. The unicameral legislature has no formal procedures requiring a supermajority, and the current electoral system can lead to a lopsided majority of seats with only a plurality of votes. In sum, a unified party with a plurality – not even a majority – of votes at election time has unchecked power for four years. This can lead governing parties to ignore changes in public opinion and press ahead with unpopular policies, which in turn can lead to systemic instability. I think the system would be healthier and more stable if it were a bit harder for a party to maintain unity in the face of low public popularity. The fragmentation argument is actually one of the primary attractions of open list to me, though I think most people might disagree with me. With all these attractive features, it might surprise you that I don’t think Kao Chih-peng’s proposal is wise. His proposal is simple, only changing one thing about the current system. Changing from closed list to open list might work, but you’d have to tweak a couple other things as well. From a practical standpoint, voting would be a nightmare. In 2012, eleven parties presented party lists for the 34 list seats. Since every party has a strong incentive to nominate a full list, that would be 385 options for each voter. How large would the ballot paper have to be? In Brazil, each candidate gets a four digit code that the voter writes down. In another country in Latin America (Colombia? ), they did away with the enormous ballot paper and simply put a huge poster with all the candidates and their codes in each voting booth. However, in Taiwan there is a long tradition of only allowing voters to stamp something. Maybe you could use electronic voting and sort them by party, but can you imagine Grandma with Alzheimer’s trying to scroll through all those options trying to find that one that she can barely remember to begin with? More importantly, 34 seats is a large district. With electoral systems, larger districts exaggerate the effects. Thus, you would get an extremely proportional result. Instead of mild incentives toward pork barrel politics and factionalism, you would get very strong incentives. Worst, I fear extremists and corrupt politicians rather than mainstream politicians would be the biggest winners. Remember those superstars? In larger districts, they will get enormous numbers of votes. Mainstream voters will gravitate toward these better known people, perhaps even hoping to send a message that they support mainstream values. These superstars will win the top seats on the party list. However, if they soak up all the mainstream votes, the lower ranked and relatively anonymous winners can win seats by relying on much narrower constituencies. They might depend on a particular locality, they might buy votes, or they might mobilize a small segment of extremist voters by taking a particularly extreme position. To give an extreme example, in the 2010 election for the Brazilian Chamber of Deputies, Rio de Janeiro elected 46 seats. The Party of the Republic (PR) got 1,202,364 votes, which entitled it to 7 seats. The first winner was Anthony Matheus de Oliveira, who won 694,862, or over half the total votes cast for the PR in Rio. I think it is fair to say he represents the mainstream of that party. The sixth and seventh seats were won by Liliam sa de Paula and Paulo Feijo Torres, who won a mere 29,248 and 22,619 respectively. I don’t have any idea who voted for them, but they clearly represent a much narrower slice of voters than Matheus. Given the conventional stories about Brazilian politics, it is quite possible that they got most of their votes from a specific town or special interest. What would happen in Taiwan? The KMT had enough votes to elect 16 people in 2012. It’s pretty easy to imagine that famous people, such as Speaker Wang and Deputy Speaker Hung would have gotten sizeable chunks of votes. However, it is also easy to imagine the 15th and 16th winners securing their victories with far narrower support bases. I think that if Taiwan were to adopt open list voting for the party list tier, it would be wise to divide Taiwan smaller districts. For example, you might do use north, central, and south districts, each electing 10-15 people. This would greatly reduce the size of the ballot paper. More importantly, it would reduce the gap between the first and last winners on each party list and force contenders to appeal to a wider spectrum of voters. The downside is that smaller parties would be disadvantaged by the higher effective threshold. Rather than needing to get 5% to cross the legal threshold, a party might need 9% to win one seat in a 10 seat district. However, a further tweak borrowed from Germany could remedy this problem. In Germany, seats are determined by the national party votes. These seats are then assigned to each state, where winners are determined by the ranks on those state lists. I don’t think Taiwan will end up with an open list system. I think we will move toward the obvious changes that are already on the table and cause the minimum amount of disruption. I think we eventually will get a German-style MMP system. To increase the number of seats, the easiest fix is simply to maintain the current 73 districts and 6 aboriginal seats and increase the number of list seats to 79. They’ll make a big deal of minor changes (lowering the threshold to 3%) or almost irrelevant changes (lowering the voting age to 18). More critical parts of the system, such as whether dual candidacies are allowed will be ignored or dealt with as an afterthought. I’m not aware of any MMP systems in which candidates are not allowed to register in both tiers, but Taiwan might become the first. This reform would improve on the awful current system in a number of ways, but it wouldn’t do anything about the concentration of power. In fact, that system would make party leaders even more powerful than they are now. I’d rather have some version of open list, but I suppose it isn’t my choice. In the conclusion of my previous post about the DPP primary in Kaohsiung 9, I casually suggested that Chen Hsin-yu of the Hsieh faction was probably well ahead of Lai Jui-lung of the Chen Chu (CC) faction. Today the results were released, and, as you probably should have expected, I was wrong. Lai won the polling primary by a clear 5%, 33.70 to 28.79%. Moreover, Chen Hsin-yu (and everyone else) acted as if she expected to win. Leading candidates are the ones who keep repeating that everyone should just follow the process and have a fair and clean test of strength. Calls for more negotiations, delays, or changes in the process always come from people who think they are losing. So what happened? I think this has to be considered a huge triumph for Chen Chu. Because Chen Shui-bian’s son was involved and because this turned into a fairly nasty fight between Hsieh and CC, this race got a lot of media coverage. By the time the polling was held, we all had a pretty clear idea that this was a proxy war between the CC and Hsieh factions. Normally, even in nasty faction battles, the individual candidates are the deciding factors. I assume most of the 28% who supported Chen Hsin-yu made their decision because they supported her personally. However, I simply can’t make that assumption for the relatively anonymous Lai. His 33% almost certainly reflects a tremendous vote of confidence for CC. Maybe I shouldn’t be surprised that CC is different. She is more popular than almost any other mayor. Her satisfaction ratings have been in the 70s for several years, and she is consistently rated as one of the best two or three mayors in the country. She just won re-election with an unthinkable 68%. Moreover, she runs Kaohsiung, a major city with a big budget. She has a lot of resources to spread around, and she is very good at spreading them around. She has been so effective at building her faction in Kaohsiung that people commonly talk of the “Chu Faction” rather than of the local New Tide faction. (Among the current seven DPP legislators from Kaohsiung, Li Kun-tse is her nephew, Chiu Chih-wei was previously in her mini-cabinet, Chiu Yi-ying (who is usually considered part of the Su faction) is married to the deputy mayor, and Lin Tai-hua has connections to the New Tide faction. I don’t know anything about Hsu Chih-chieh, and the other two are in the Hsieh faction.) Given the overwhelming dominance of the DPP in Kaohsiung 9, she has almost certainly just added another major post to her faction’s power base. If Chen Chu is the big winner, Frank Hsieh and Chen Shui-bian are the big losers. The former president no longer has enough popularity to win a primary for his son, even when deep green voters were jolted back to 2007 by unfounded accusations of corruption. At least he withdrew before suffering a humiliating defeat. The former premier went into this battle with a clear advantage in candidate quality and suffered a stunning loss in the city he governed for six years. If other races go like this, this could be the year that the old factions formed in President Chen’s second term give way to new factions oriented toward politics in the next decade. I should note that this primary has worked out quite well for Tsai Ing-wen. For one, she has always had better relations with Chen Chu and New Tide than with Hsieh and A-Bian. For another, her top goal was simply for the green side to settle on a single candidate in order to win the seat. That seems to have been achieved. For a third thing, this contest may have silenced Chen Shui-bian. Tsai didn’t want to have Chen Chih-chung running for the simple reason that she didn’t want the blue camp and the media constantly talking about him. She wants voters to think about what a lousy president Ma Ying-jeou is, not what a lousy president Chen Shui-bian was. By allowing Chen Chih-chung back into the DPP, she forced him to take part in the party primary where he could be defeated. Even better, the Chen family withdrew, perhaps because they were made aware of how tenuous Chen’s medical parole is. I can’t imagine the former president will stay completely out of the limelight, but he made have come to understand that a lower profile has some advantages. A silent Chen is exactly what Tsai wants. Finally, I want to make a point about intra-party fights. These fights are healthy for the DPP. If Chen Chu’s power is increasing and Hsieh’s is waning, it will be better for the party if that is out in the open. Conflict can be papered over in the short-term, but eventually they will burst out into the open. Now, a full ten months before the election, is the perfect time to have those fights. Remember what happened four years ago when the DPP tried to avoid having a fight over its party list. They delegated power to Tsai Ing-wen to determine the list. Inevitably, people were unhappy with the result. Moreover, since the losers had not had a chance to have an open fight, they felt cheated. They raised the issue deep into the presidential campaign, complaining that Tsai’s list was “the same old people” and it didn’t have any social activists or progressives, and demanding that it be revised. In addition to damaging party unity, this long, drawn-out fight tarnished Tsai’s image as a leader and the DPP’s image as a reformist party. They would have been much better off with a vicious but fair and open fight in the early spring. Almost as much as fights between parties, fights within parties are an essential part of the democratic process. Why did Chen Chih-chung drop out of Kaohsiung 9? Last week, former president Chen Shui-bian’s 陳水扁 son, Chen Chih-chung 陳致中, dropped out of the DPP’s contest for the nomination in Kaohsiung 9. This took me (and most people I talked to) by surprise. What’s more, Chen Chih-chung justified his action with a very strange explanation: He didn’t want people to think the struggle between Frank Hsieh 謝長廷 and his father was still raging. Great, but no one seemed to think that this struggle was tearing apart the DPP in the first place. After reading a few media reports and reflecting on the history, I think there is an interesting story behind all this. The short answer is that this is, in fact, a raging factional conflict. However, it isn’t the one Chen Chih-chung tried to make us think about. Rather, this is all about the conflict between Hsieh and Kaohsiung mayor and New Tide faction bigwig Chen Chu 陳菊. The A-bian faction is involved, but it isn’t the main player. The long answer starts years and years ago, and even though this is a story about Kaohsiung it starts in Taipei. Chen Shui-bian and Frank Hsieh were arguably the two brightest stars to emerge from the cohort of defense lawyers at the 1980 trials for the Kaohsiung Incident. They both went into electoral politics in 1981, winning seats to the Taipei City council. In 1985, Hsieh easily won re-election. Chen went back home to Tainan, trying to become the Tainan County magistrate. He lost that race, and days after the election his wife, Wu Shu-chen 吳淑珍, was run over in a mysterious (that is, not mysterious at all) traffic accident and permanently paralyzed. Legislative elections were held in 1986, and both Hsieh and Chen decided to contest them. Chen was convicted of libel and spent several months in jail, so he could not personally run. Instead, he put his wife forward as a candidate. There were three main opposition candidates in the Taipei City race, Hsieh, Wu, and senior opposition leader Kang Ning-hsiang 康寧祥. Everyone expected that Hsieh would win a huge victory. Indeed, many were worried that Hsieh would win too many votes and cause both Wu and Kang to lose. On election eve, Hsieh famously told the crowd to cast their first vote for Kang, the second for Wu, and only the third vote should go to him. Apparently they took this advice to heart, because both Kang and Wu won, while Hsieh unexpectedly lost. In 1989, Hsieh ran again while Chen replaced his wife as the candidate. By this time, the two were developing a friendly rivalry, vying for leadership in the DPP. Hsieh still had the upper hand at this point, clearly outpolling Chen, though both easily won. Once both entered the legislature, however, Chen began to overtake Hsieh. Chen was a master at getting favorable media coverage, and he was an extremely effective legislator. In 1992 Chen outpolled Hsieh, and he was widely considered the DPP’s most outstanding legislator. By this point, the rivalry between the two was in full gear. Moreover, since the regime had agreed to open up the Taipei mayor to elections, the two were now fighting over something concrete. By early 1994, it was apparent that Chen would win the nomination, but it was not clear how Hsieh would deal with the loss. Many people wondered if Hsieh would quit the DPP and run an independent campaign rather than yielding to Chen. In the event, Hsieh decided to stay in the DPP and support Chen’s candidacy. When Chen won and became a superstar mayor, Hsieh seemed to be out in the political wilderness. Hsieh had grown up in Taipei City and his whole career had been based in Taipei City, but with Chen in the mayor’s chair Hsieh decided to look elsewhere. He cast his gaze southward, to Kaohsiung City, where the mayor’s seat was held by future Premier and Vice-President Wu Den-yi 吳敦義. Before challenging Wu, however, Hsieh had to first secure the DPP nomination. His prime competition came from Chen Che-nan 陳哲男, a member of Chen Shui-bian’s inner circle. Chen Che-nan had been a Kaohsiung legislator when Chen Shui-bian appointed him as head of the Civil Affairs Department in Taipei City. After several years of experience in governing, Chen Che-nan was ready to return home to put his training to work. Hsieh would have won a popularity contest, but it might have been draining and acrimonious. Chen Shui-bian stepped in to prevent this by convincing Chen Che-nan to withdraw. Mayor Chen didn’t rely merely on his personal charisma or appeal to party loyalty, he cemented the withdrawal by promoting Chen Che-nan to secretary general of the Taipei city government. After the path to the nomination was cleared, Hsieh shocked everyone by beating Wu despite a double digit poll lead for the incumbent. As mayor, Hsieh embarked on several new projects. The most famous of these included cleaning up Kaohsiung’s rivers, improving the city’s water quality, and building the MRT lines. He easily won re-election in 2002 and was promoted to Premier in February 2005. Chen Che-nan’s son, Chen Chi-mai 陳其邁 was appointed as Acting Mayor of Kaohsiung City and seemed primed to win a full term in 2006. (If you are counting, we are now up to five people named Chen. Isn’t anyone named Lee or Chang anymore?) Up to this point, the story is one of Chen and Hsieh sometimes competing, sometimes cooperating, and always as rivals. The New Tide faction hasn’t really entered into this particular story yet. In August 2005, Thai laborers working on the MRT project rioted. This would eventually turn Kaohsiung politics upside down. The workers were protesting working conditions and low pay. Investigations showed that the workers were being severely underpaid. They were only being paid for some of the overtime hours they worked, and they were only actually being paid NT20000 a month when the government had budgeted NT29500. The story got dirtier and dirtier the deeper investigators probed. As former mayor, Premier Hsieh bore some responsibility for the corruption. However, he managed to avoid any legal charges and, for the most part, he also avoided taking political responsibility. A second person who might have born responsibility was the head of the Council of Labor Affairs, Chen Chu. Labor Affairs, after all, was the office in charge of managing foreign workers, and it should have overseen working conditions to ensure that the Thai workers were treated appropriately and paid on time. Chen Chu managed to avoid any connections with the corrupt aspects of the case, but she did resign her office. The responsibility for the corruption fell most squarely on Chen Shui-bian’s close advisor, Chen Che-nan. Chen Che-nan had been deeply involved with arranging several of the contracts. The smoking gun came when the TV news showed a video of him with one of the company executives at a casino at a resort in South Korea. Chen Che-nan was eventually convicted and went to jail, while his son, Chen Chi-mai, had to resign as Acting Mayor. Let’s stop the Kaohsiung story here for a minute to jump up to national politics. During President Chen’s first term, he forged an alliance with the New Tide faction. Indeed, since most members of his own Justice faction were very junior, the New Tide faction was able to put many senior members in several key positions in the government. Chen Chu was one of the most prominent. While Labor Affairs is not a particularly powerful ministry, Chen Chu turned it into something of a training agency for New Tide politicians and the Labor Affairs bureaucracy was widely considered to be a major center of New Tide power. After President Chen’s re-election, New Tide started to distance itself from him. Several New Tide members resigned posts in the executive branch, and in the legislature New Tide ceased pushing Chen’s agenda. Chen Chu’s resignation from Labor Affairs was a key step in this process. President Chen did not insist that she stay in the cabinet, and many saw this as a clear sign that the Justice-New Tide coalition was decisively shattered. During 2005 and 2006, more and more stories of corruption in the Chen administration emerged, and New Tide moved into open warfare with the administration. Two New Tide legislators resigned their seats in 2006, calling for reflection and self-renewal. This did not sit well with the rest of the party. The Red Shirt protests and the attempts to impeach Chen led the rest of the party to close ranks in defense of his presidency. Increasingly, all the other factions saw New Tide as traitors and enemies. Eventually, Frank Hsieh would win the 2008 DPP presidential nomination by portraying Su Tseng-chang as an ally of New Tide and running against New Tide. Returning to Kaohsiung, the next fight was over the 2006 mayoral nomination. Chen Chi-mai’s candidacy was fatally damaged by the MRT scandal. He was replaced as Acting Mayor by Yeh Chu-lan 葉菊蘭, a Hsieh ally. Hsieh had perhaps resigned himself to losing control of the city to the Justice faction as the cost of becoming Premier. Now, with Yeh in charge, he had a chance to retain the city within his own faction. Unfortunately for him, Yeh was only the second most popular candidate. Chen Chu was the leading candidate. A United Daily News poll published March 18 showed Chen Chu supported by 23%, Yeh Chu-lan 12, Chen Chi-mai 11%, and legislators Kuan Pi-ling 管碧玲, Tang Chin-chuan 湯金全, and Lin Chin-hsing 林進興 had 6%, 5% and 5%, respectively. (On the KMT side, Huang Chun-ying 黃俊英 had 12%, Huang Chao-shun 黃昭順 and Chen Hsueh-sheng 陳學聖 each had 9%, Chiu Yi 邱毅 had 7%, and Huang Chi-chuan 黃啟川 had 6%.) Knowing that she could not win a polling primary, Yeh refused to register for the DPP primary. Hsieh tried to maneuver to get the party to simply draft Yeh or to change the decision process to some other criteria, but Chen Chu refused to budge. She insisted that the process should proceed according to the established party rules. However, she did agree to restart the process to give Yeh another chance to register. When Yeh still refused to register, Kuan Pi-ling (Hsieh’s other stalking horse) dropped out and conceded the nomination to Chen Chu. To recap, Chen Chu managed to swoop in and take over the Kaohsiung City government, which both the Chen and Hsieh factions thought they had prior claims to. This occurred in a very acrimonious atmosphere, with Chen Chu’s New Tide faction locked in vicious party infighting with the other factions. All sides were deeply scarred by this experience. Fast forward to today, nine years later. Chen Chu has been a very energetic and popular mayor, but now she is in her final term and the various sides are beginning to prepare for the fight to control the city after 2018. As she did at Labor Affairs, Chen Chu has used the city government to train a new generation of politicians, building up a powerful faction of people loyal to her. These are not exclusively New Tide members, but many are. As the end of her term nears, she will undoubtedly try to promote one of her protégés as her successor. However, the Hsieh faction is also plotting to take back the city, and they have the early front-runner in legislator Kuan Pi-ling. There is even a chance that Chen Chi-mai, who has re-emerged from obscurity as an ally of Tsai Ing-wen 蔡英文, might be able to regain the mayor’s chair. At this point, it is all very early. The 2016 legislative elections are seen as a key opportunity to bolster each faction’s strength before the 2018 battle. Hsieh fired the first shot, by mooting the possibility of contesting the Kaohsiung 3 seat. The Hsieh faction already has two legislators in Kaohsiung (Kuan and Chao Tien-lin 趙天麟), and the Chen Chu faction did not want to see it win a third. They immediately responded by recruiting former deputy mayor Liu Shih-fang 劉世芳 to contest the nomination in Kaohsiung 3 and simultaneously by shaming Hsieh for choosing to contest such an “easy” seat. Hsieh promptly withdrew. This finally brings us to Kaohsiung 9. Until the last day of registration for the DPP nominations, this looked like a race between Chen Chih-chung and a city councilor from the Hsieh faction surnamed (what else?) Chen. At the last minute, Lai Jui-lung 賴瑞隆, who had worked in the city government as head of the Marine Bureau, also registered. The race was then suddenly catapulted into the national limelight when remarks by a New Tide faction leader, Hsu Chia-ching 徐佳青, surfaced accusing President Chen of taking millions of dollars from construction companies and asking what Chen Chih-chung had ever done that he should deserve a legislative seat. Then, after a couple of days of complaining about being wronged and seeming to be on the offensive, the Chen family suddenly surrendered, with Chen Chih-chung withdrawing from the race even though he claimed to be leading by 10 points, promising not to continue the Hsieh-Chen (Shiu-bian) conflict, and suggesting that Chen Hsin-yu 陳信瑜 should also withdraw. In retrospect, it seems as though the hidden story might go like this. Chen Chu’s primary aim was to prevent the Hsieh faction from winning the nomination. If Chen Chih-chung could beat Chen Hsin-yu, that would be fine. However, it seems plausible that Chen Hsin-yu was actually leading. We don’t have any public media polls, but the key players all have private polls and they certainly knew how the race was shaping up. In order to block Chen Hsin-yu, Chen Chu sponsored her own candidate. She then had to persuade Chen Chih-chung to withdraw and endorse Lai. This was complicated by Hsu Chia-ching’s incendiary comments. Both Hsu and Chen Chu belong to the New Tide faction, so it is natural to assume that Hsu’s comments were made with the aim of advancing Chen Chu’s goals. In fact, the end result was that Chen Chih-chung withdrew and endorsed Chen Chu’s candidate. However, I don’t think that Hsu’s comments were a part of any master plan, and they probably impeded rather than aided Chen Chu. During President Chen’s second term, cracks began to appear in the previously rock-solid New Tide faction. Northern and southern wings of the faction began to emerge, with the northern wing more stridently opposed to President Chen and the southern wing being more pragmatic and more sympathetic to Chen. Hsu is from the northern wing, and her distaste for Chen Chih-chung is probably a lingering aftermath of a decade ago. I think her attacks were sincere rather than strategic, since (a) she had no expectations they would be made public and (b) they ruined her otherwise promising career. I don’t think her primary goal was to stop Hsieh or help Chen Chu. I think she was simply disgusted by Chen Shui-bian and Chen Chih-chung. Chen Chu, who represents the southern wing of New Tide, was trying to make an alliance with Chen Chih-chung, and these attacks potentially complicated that effort. However, she eventually persuaded Chen Chih-chung to withdraw. The rivalry with Hsieh was a smokescreen. Several media reports suggested that this appeal originated from Chen Chu’s camp, not Chen Chih-chung’s. In fact, there was considerable pressure on Chen Hsin-yu to withdraw, as many DPP supporters bought into the idea that the principal contestants should all withdraw in the interests of party unity and healing the scars opened up by Hsu Chia-ching’s accusations. I suspect that the real reason Chen Chih-chung withdrew is that he was trailing in the polls. If he had actually run and lost decisively, it might have been a devastating blow to his family. Clear evidence of weak public support combined with new accusations of corruption might be enough for the Ma government to revoke Chen Shui-bian’s medical parole. Chen Chih-chung was intent on framing his withdrawal to appear as if he was acting for the greater good. As he told it, he withdrew, even though he was leading and even though his family had been slandered, for the greater good of the party and to heal factional rifts. He even apologized to the previous DPP incumbent, Kuo Wen-cheng 郭玟成, for splitting the green camp vote in 2012. Even thought he has endorsed Lai, the Hsieh faction was probably also somewhat happy to see him withdraw. Assuming that Chen Hsin-yu was clearly in first place and Chen Chih-chung was clearly leading Lai, Chen Chih-chung’s withdrawal effectively left the seat wide open for Chen Hsin-yu. It is very hard to transfer support from one candidate to another, so Chen Chu’s gambit will almost certainly fail. Like Chen Chu in 2006 and most other leading candidates in countless other races, Chen Hsin-yu has insisted that the party has a standard nomination mechanism, and, rather than asking specific people to withdraw, they should simply respect the institutional rules. If Chen Shui-bian can’t win power, he at least needs goodwill. Pulling out made Chen Chu happy since he endorsed her candidate. It made Hsieh happy since it clears a path for his candidate. It made the New Tide faction happy since he stopped the counteroffensive against them and he stopped trying to put his son in the legislature. It made Tsai happy since the media won’t be able to talk about Chen Shui-bian every day for the next ten months. It made DPP supporters happy since it resolved a potentially nasty party conflict. Withdrawal was a smart option. Last week, the DPP published the list of aspirants for nominations in the 43 legislative districts.20150306180657_link I think it is time that I should write about this. First, why 43? Aren’t there 73 district seats? Yes, but the DPP is only holding open nomination contests for 43 of them. The DPP only holds open nominations in districts in which it has a reasonable chance of winning. In “difficult” districts, the party chair is empowered to identify and nominate whoever she thinks has the best chance of winning. Difficult districts are defined as those in which the DPP legislative candidate got less than 42.5% in the previous election. The DPP currently holds 26 of the 43 districts. 24 incumbents are running for re-election, and two are retiring. 19 of the incumbents are running unopposed, while five face primary challenges. 15 of the other 17 districts have more than one aspirant. Former Yunlin County magistrate Su Chih-fen 蘇治芬 is running unopposed for the Yunlin 1 nomination, and nobody registered for the Taoyuan 1 seat, though everyone seems to think that former legislator and current DPP spokesman Cheng Yun-peng 鄭運鵬 will be drafted. The DPP’s 27th district legislator is Liu Chao-hao 劉櫂豪, from Taitung County. Since Liu won a three-way race in 2012 with only 41.6%, he represents a “difficult” district and does not have to face a primary. This is somewhat ironic. In early 2010, the DPP shocked everyone by winning several by-elections in deep blue territory. Taitung was one of these, with the DPP’s Lie Kun-cheng 賴坤成 narrowly edging a KMT candidate awash in corruption allegations. This was the first time the DPP had won anything in Taitung, so you might have expected they would go out of their way to protect this precious asset. Instead, Lie was forced to defend his hard-earned seat in a party primary, where he was challenged by and lost to Liu Chao-hao, the only other prominent DPP politician in the county. I don’t know if Lie was planning to try to regain his seat by challenging Liu in this year’s primary, but because Taitung is a “difficult” district, he doesn’t have a chance. He has to be wondering why that rule couldn’t have been put in place four years earlier. I’m going to look at a few of the more interesting nomination contests, but let’s first consider a basic bit of electoral math. There are 73 district seats, 6 Aboriginal seats, and 34 party list seats. If the DPP wants to win a majority, it will probably need to win 40 district seats. This seems a more reachable goal than winning an Aboriginal seat or winning an 18th party list seat. So how hard would it be for the DPP to win 40 district seats? The DPP’s presidential vote share is a good indicator of how difficult a given district is before adding in all the local considerations. We can rank the 73 districts from Tsai Ing-wen’s highest vote share to her lowest vote share. The green bars are seats the DPP won in 2012, while the pink bars are seats the blue camp won. In the first 25 districts, Tsai broke 50%, and the DPP generally won these districts. In the 26th through 40th districts, Tsai got between 45 and 49%. These districts were the battleground, with the DPP and KMT roughly splitting them. In the 41st through 73rd districts, Tsai got below 45%, and the DPP lost all of them except for Taitung, where the KMT’s vote was split. There are a few things to note about this. First, the KMT did relatively well in the DPP’s territory and in the battlegrounds, but they had two big advantages. For one thing, most of the races featured a KMT incumbent. For another, in almost all of those battleground districts, Ma actually outpolled Tsai. That is, the DPP managed to win a hefty share of seats in districts in which they had to challenge an entrenched incumbent and they had to make up a small deficit in party votes. Second, most every expects Tsai to do better in 2016 than in 2012. That will put many of those 2012 battleground districts firmly into the DPP majority column in 2016. Third, it might sound demanding to expect the DPP to win 40 out of 73 districts, but they actually won their 40th best district in 2012. That district was Taichung 6, which was won by Lin Chia-lung 林佳龍 (and retained easily by Huang Kuo-shu 黃國書 in the by-election last month). Taichung 6 might not still be the DPP’s 40th best district, but neither is it expected to be much of a challenge for the DPP to retain. The point is, the DPP had a reasonable chance at a majority in 2012, and they will have an even better chance in 2016. Let’s imagine that Tsai’s vote share goes up by 5%. It wouldn’t go up by exactly 5% in each district, but the increase probably wouldn’t vary too much. For our purposes, it’s probably not too crude to imagine a uniform 5% increase everywhere. That would give the DPP’s presidential candidate a majority in the top 40 districts and would put districts 41-53 into that 45-49% range where the DPP would have a chance to steal a few more seats. Of course, the DPP almost certainly wouldn’t sweep the top 40 seats. There are some KMT incumbents who will be able to hold out against the tide. 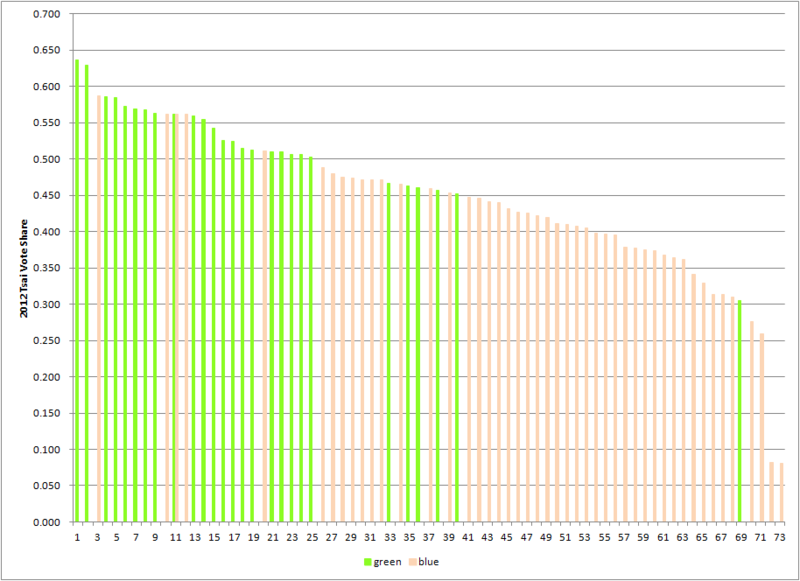 However, this math is starting to look more daunting to the blue side than to the green side. That’s all well and good, but the candidates matter, too. Let’s look at a few of the more interesting districts. New Taipei 6 (the northeast half of Banqiao) will be one of the most interesting districts in the general election. It is currently held by Lin Hung-chih 林鴻池, who was the KMT’s party whip during the September struggles and the Sunflower Movement. When Ma couldn’t remove Speaker Wang from the legislature, he tried to route everything through the party caucus. Lin was thus a key cog in Ma’s struggle to hollow out Wang’s position. I’m not sure how Lin felt about being caught up in this power struggle, but he always played the loyal soldier. Now he has to face the electoral consequences. In 2012, the DPP nominated a relatively weak candidate, and Lin’s deep local connections produced a fairly easy re-election. However, his district is by no means deep blue territory. Tsai got 47.1% here, making it the DPP’s 32nd best district. Lin won’t go down easily, but this district could be a major trophy for the DPP. Ambitious DPP politicians can apparently sense this district’s vulnerability. Four solid aspirants have thrown their hats into the ring. Chuang Shuo-han 莊碩漢 is a former legislator who acquitted himself well during his tenure in office. Yu Mei-mei 余莓莓 is a well-known talk show host. You Ping-tao 游秉陶 hasn’t done anything (that I know of), but he has an influential father. His dad is Yu Hsi-kun 游錫堃, the former Premier who just came within a few thousand votes of defeating Eric Chu 朱立倫. The strongest candidate might actually be the least nationally-known one. Chang Hung-lu 張宏陸 is a city councilor, and he is also one of Su Tseng-chang’s 蘇貞昌 most trusted lieutenants. Unlike Yu and You, Chang has been working the district for a decade. Chuang has local ties dating back at least to the early Chen Shui-bian era, but I’m not sure how intensively he has been maintaining those ties. The national media focus is on the former premier’s son, but I have doubts he will be able to survive this heavyweight primary. Right next door in New Taipei 5 (Shulin), another high-profile second generation aspirant looks to enter the legislature. Former premier Su Tseng-chang’s daughter, Su Chiao-hui 蘇巧慧, is running against former city council member Ou Chin-shih 歐金獅 and Liao Yi-kun 廖宜琨, the son of former legislator Liao Pen-yen 廖本煙. The younger Su is a lawyer who is most famous for overseeing the DPP’s legal team in the 2004 presidential election recount. She has also been running her father’s foundation for a few years. Su has chosen an excellent district to contest. One of her opponents lost his re-election bid last year, while the other is the son of the candidate who lost the legislative races in 2008 and 2012. The Liao family will have a hard time arguing they deserve a third chance. This district is also perhaps the DPP’s best target for a pickup in New Taipei City. Tsai got 47.4%, making it the DPP’s 29th best district. The KMT incumbent is Huang Chih-hsiung 黃志雄, who was a famous athlete in karate. He hasn’t done very much in office, though. This district is extremely vulnerable. Su Tseng-chang has strong representatives in New Taipei 5 and 6. He also has a close ally in New Taipei 4 (Xinzhuang). Wu Ping-jui 吳秉叡 and Chang Hung-lu might be his two closest lieutenants, and Su Chiao-hui is his daughter. These are also all winnable districts. Su could be very busy campaigning in New Taipei in the fall, and he could have a strong delegation in the next legislature. The third prominent second-generation candidate is in Kaohsiung. Former President Chen’s son ran as an independent in Kaohsiung 9 four years ago and split the green vote, throwing this deep green district to the KMT. This year, he is trying to win the district by first winning the DPP nomination. This nomination contest will probably be a referendum on how people feel about the president and his son, with the other two candidates merely being not-Chen. Until today’s breaking news, I assumed that Chen Chih-chung 陳致中 would easily win the nomination and the seat. The DPP cannot afford to mess up this district again. All five nominations in Tainan are being contested. It’s not surprising to see intense competition over the two seats with retiring incumbents. In 2012, Wang Ting-yu王定宇defeated a five-term incumbent in the District 5 primary and set off an intense struggle for the nomination that was only resolved by giving the seat to a geriatric Mark Chen 陳唐山 for a term. Chen is now retiring, so Wang is trying to get take the seat he thinks he should have won four years ago. I don’t know anything about the city councilor opposing him, but I wonder if they are continuing the same feud. In District 4, a former DPP spokesman, Lin Chun-hsien林俊憲, is facing off against a former chair of the city DPP party branch, Tsai Wang-chuan蔡旺詮, and a couple other people. Wang, Lin, and Tsai could all be future party stars. What’s more surprising is that all three incumbents are being challenged. I think two things might be going on. First, the local DPP is in a bit of a crisis because of the city council speaker scandal. Several DPP councilors were implicated, and there is now a pretty vicious fight between the various factions. It’s probably oversimplifying, but the New Tide faction led by Mayor Lai 賴清德 is struggling for supremacy with the faction loyal to former President Chen. This leads to the second factor. The various sides are starting the fight to see who will take over Tainan in 2018 (or maybe 2016 if Lai becomes VP). The three incumbent legislators are the most likely to be the next mayor, so some of these challenges might be attempts to remove them before that fight. As long as the DPP can manage to settle the fights before next January, these should all be easy victories. Staying in the south, Kaohsiung 3 (Nanzi, Zuoying) is held by KMT stalwart Huang Chao-shun 黃昭順. Huang had always been considered to hold a safe seat. Zuoying has a large military population, and most people thought that and Huang’s two decades of local connections were too much of an advantage for the DPP to overcome. Four years ago, many people were quite surprised that DPP city councilor Lin Ying-jung林瑩蓉came within 6,000 votes of upsetting Huang. Tsai won 46.6%, making it the DPP’s 34th best district. This year, when ambitious DPP politicians looked around for a good district to try to attack, several focused on this district. Former Premier Frank Hsieh 謝長廷 declared he would run in a difficult district (which would springboard him to the Speaker’s chair), and he seemed quite surprised to find that the rest of the world had also figured out that Kaohsiung 3 was not so impossible. He was promptly shamed into targeting a more difficult district (perhaps Taipei 1). Meanwhile, back in Kaohsiung 3, Lin Ying-jung is trying to win a second opportunity. She probably deserves it, but she is not getting a free pass. She is being challenged by Liu Shih-fang劉世芳, a former Kaohsiung City Deputy Mayor and a New Tide faction leader. It will be interesting to see if the local politician or the one with a national profile comes out ahead. You have probably noticed the term “city councilor” popping up repeatedly. This is not an accident. In most of these open seats, the DPP nomination is being contested by one or several city or county councilors. A generation ago, the DPP didn’t have these sorts of grassroots politicians ready to move up the ladder. After two decades of inroads into local politics, the DPP is no longer at a clear disadvantage. They can field candidates with strong local connections almost as easily as the KMT. I can’t tell you much about any of the people who registered for DPP nominations in central Taiwan, but they are almost all local office holders. Finally, let me mention three districts that are officially “difficult.” The DPP failed to get 42.5% in the legislative races in 2012 in Taichung 3 (Tanzi), Taichung 8 (Fengyuan), and Changhua 1 (Lugang), but that reflected weak legislative candidates rather than general party unpopularity. Tsai got 47% in all three, making them the 28th, 30th, and 31st ranked districts. These are districts that the DPP should consider as winnable rather than as difficult and unlikely. Last week, a group of prominent figures, including Shih Ming-teh 施明德, Sean Chen 陳沖, and Su Chi 蘇起, proposed that Taiwan should employ a new electoral system, which they called “negative voting.” As I understand the proposal, this is intended for single seat elections. Each voter would still cast one vote. Currently, the vote must be a positive one, so that each vote increases the candidate’s total by one. Under this proposal, the voter would have the option to either cast a positive or a negative vote. A positive vote would increase a candidate’s total by one, while each negative vote would decrease the candidate’s total by one. Vote totals aside, the important point is that the new system changes the outcome. Instead of the leftist (who led in first preferences), the moderate is now the winner. Some people see this as a desirable outcome. In technical jargon, B is the Condorcet winner. That is, B wins the head to head matchups against all the other candidates. (In a one on one matchup, B beats A, 60-40, and B beats C, 70-30.) Negative voting empowers moderates! Hooray! Not so fast, but hold that thought while we first explore a different idea. Negative voting will be most useful to factionalized parties who cannot agree on a single candidate. Image that party A has a majority in society (A: 55; B: 45), but it has two big factions that will not yield to each other. Eventually both candidates, A1 and A2, both decide to run. Assume that the first preferences now break down as follows: A1: 30, A2: 25; B: 45. In a plurality race, B is going to coast to an easy victory. However, if 80% of party A’s voters vote negatively, they can avoid losing to B, even though they were unable to resolve their intra-party squabble. The result would be A1: 6, A2: 5, B: 1. I think this is the real purpose of the proposal. People inside the KMT fear that the Wang and Ma factions are terribly split, and they will not be able to cooperate (perhaps even if Chu runs). Or perhaps Ma simply wants to run his own candidate. Negative voting avoids the problem of resolving intra-party tensions by simply allowing KMT sympathizers to vote against the DPP. Of course, this assumes that the KMT is still the dominant party. I understand that many people within the KMT believe that the voters will come back to them when real power (ie: national power) is at stake, though I suspect they are fooling themselves. I think their fundamental problem is that Tsai Ing-wen might have over 50% of the votes, not that the pro-Ma and anti-Ma factions can’t cooperate. At any rate, I think there is tremendous value in forcing a party that wants to hold governing power to first be able to resolve basic internal conflicts. If a severely factionalized party wins power, will it be able to effectively govern? Let’s go back to that idea about negative voting encouraging moderates. Imagine a two candidate race, with A narrowly leading B by 52-48. What could B do to change the outcome? What if an extremist candidate BB on B’s side of the spectrum jumped in? In a normal plurality race, this couldn’t help B at all, since any votes BB won would almost certainly be taken from B. However, with negative voting, it might be different. Imagine BB is a terrible person, spewing all sorts of offensive and inflammatory rhetoric. BB would be all over the news, and voters would be outraged. In fact, some might come to the conclusion that it is important to resoundingly reject BB’s horrible ideas. However, those negative votes against BB would probably come predominantly from A’s side of the spectrum, since BB’s ideas would naturally be extremely offensive to them and only moderately offensive to voters on B’s side of the spectrum. If BB won positive support from 1% (originally B voters), while 7% of A voters and 1% of B voters decided to make a statement by voting against BB, the result would now be A: 45, B: 46, BB: -7%. BB would in fact be resoundingly rejected. However, this would also throw the election to B.
I think most of us can agree that democracy is not well-served when vile extremists can affect the outcome of a race by hurting the chances of the mainstream candidate on the other side of the spectrum. This is why positive voting, in which voters have to support something, is the norm. With positive voting, candidates are not rewarded for being offensive. With negative voting, the more offensive a candidate is and the more voters that are shocked into rejecting him or her, the more power and influence that candidate has. To put it bluntly, this proposal for negative voting is a terrible idea. A short comment on the idea that negative voting would save money: Candidates/parties currently get NT30 for each vote, so negative voting would supposedly reduce the public subsidy. I’m starting to believe that the surest sign that some proposed electoral reform is a bad idea is that its proponents stress how much public money it will save. It seems almost like they are trying to distract us from their weak arguments about why it will produce better politics with shiny, shiny money! There is a good reason for the public to subsidize parties. We have a general interest in parties that have the capacity to do things like formulate policy platforms. Bureaucracy and think tanks cost money. Back in the mid-1990s, when Shih Ming-teh was DPP party chair, the DPP could barely afford to pay rent. His predecessor Huang Hsin-chieh 黃信介 routinely wrote a personal check to cover the DPP’s monthly operating costs. That party struggled to avoid bankruptcy; it certainly did not have the capacity to do long term planning or prepare a broad set of policy proposals that it might pursue if it were to become the governing party. Shih seems currently to be arguing that the public subsidy is a waste. I disagree. I don’t want to return to the days in which there was only one party with the capacity to govern. You are currently browsing the Frozen Garlic blog archives for March, 2015.